Men are not the only ones that experience receding hairline problems, women do as well. However, men tend to have receding hairline when they are older. Hair loss starts in men who are in their early 30s, and by the time they get to 50, they could have lost a significant amount of hair. Nevertheless, it can be quite devastating for one to experience receding hairline, whether male or female. Don't forget that the way you care for your body affects whatever happens with your body. If you consume enough fruits, vegetables, whole grains and lean proteins within a logical calorie count daily, you are eating right, and it will be evident in some parts of your body like your hair, nails, skin, etc. But when you eat more of junk foods such as candy, chips, ice cream and soda pop most of the time, you could have some problems with your nails, skin and hairs. Adopt a healthy diet plan and make sure you engage in adequate exercises that lasts for about 30 minutes for at least 5 times weekly. Don't go for hairdos that leave your hair stressed. Cornrows, braids, weaves, tight burns, and simple ponytails can stress your hairline. Always keep down your hair to minimize the level of stress your follicles are subjected to. When you tie your hair back, it is easy for strands of hair to break at the root, which causes hair loss at the temples, sideburns, bangs, and forehead. If for any reason you find out you must throw back your hair, there are ways you can reduce the stress. Keep your ponytail, braid, or bun as loose as possible. Likewise, ponytails buns that are tied below your ear heights reduce the tension placed on your roots unlike hairstyles do. Similarly, if you wish to wear a sew-in weave, speak with your hairstylist about your wish to sew the weave into net rather than sewing it into your hair directly. This is still not the idealest solution, but the net would always create less tension and cause less damage. Before you decide to pay your dermatologist a visit, it is better to spot factors that contribute to receding hairlines. Is your stress levels high? As a matter of fact, your systems can be affected by stressful events, which alters the natural hair growth cycles. 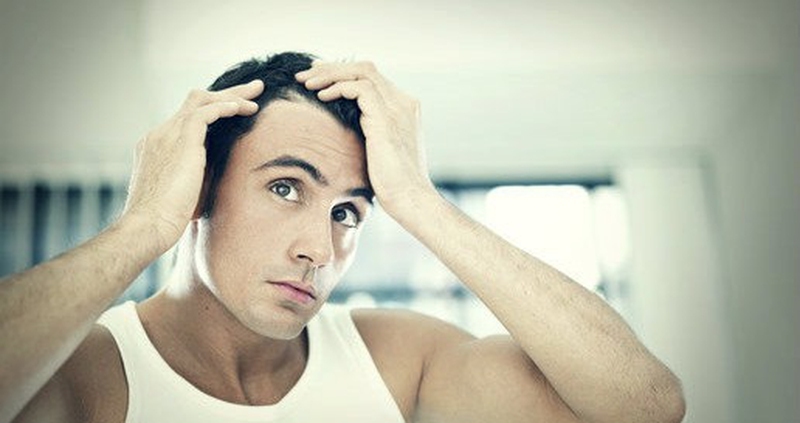 About 40% hair loss in men can be caused by major stresses in men. Managing your stress levels well should be taken seriously if you wish to prevent the receding hairline. Some hair styling products always contain alcohol. Alcohol enhances the drying of hair scalp and further worsens the receding hairline. Avoid all styling products that contain alcohol since a dry scalp can lead to hair loss. Make sure you never expose your hair to very harsh chemicals like hair dyes, bleaches, and treatments. They are also likely to have adverse effects on your already weak hair follicles and make your hair lines recede. Do not comb your hair all the time, especially combing it backward as this can make your hair fall off thus causing a receding hairline. Additionally, don't use hard brushes on your hair. Brushing your hair is one way to fix your receding hairline, but make sure you don't overdo it and don't be too aggressive while on it. Unlike most people think, there is nothing rustic or unpolished about getting a head massage. One of the most relevant rituals for getting healthy hair and scalp is through head massage. Head massage enhances the circulation of blood and gets toxins drained away from the scalp. You can carry out head massage without the use of any oil, but I would rather do it with oil. Some of the most talked about oils when it comes to how to regrow hairline are olive, sunflower, coconut, ghee, evening primrose, flaxseed, castor and avocado. Method of application? Apply the oil you choose on your scalp evenly and massage the oil gently using your finger pads. Conclude by running through your hair with your fingers. This can be done within 10-15 minutes. Leave the oil for about one hour before you wash, or leave it overnight for enhanced conditioning. You can massage at least once per week to get healthier and stronger hairline. You can equally create a kind of hair mask using lime juice, fresh avocado and coconut oil. To do this, just add a few drops of lime juice in a bowl, add a freshly meshed avocado and about 1/4 cup of fresh coconut milk. If you like, you can also add some honey, and place the mask on your head. Wash it off in a shower after 10-15 minutes and pat dry. If you are really desperate at this stage about how to regrow hairline, you must have heard about supplements that encourage hair growth or tried out some. So long as you know that instant is nothing but myth, proceed. Before taking any supplements or vitamins, first, consider all medications you are already taking and talk to your doctor. Your regular eating regimen should include a daily intake of multi-vitamin, in addition to a general healthy diet made up of fresh fruits, whole grains, vegetables, lean protein and lots of water. What happens in your body always manifest itself outwardly. When it comes to additional supplements, some women go for certain scalp treatments such as Nioxin Intensive Therapy Follicle Booster, or some hair vitamins with Biotin. Take some time to carry out researches before you invest your money and time. Continuing with ways to stop receding hairline and how to regrow hairline, there are equally different products that promise to encourage the regrowing of hairlines and prevention of hairline recession. Try using some hairline conditioners and shampoos or anything that can stop the thinning of your hair. Server responsed at: 04/25/2019 3:59 a.m.